24+ Seeds. 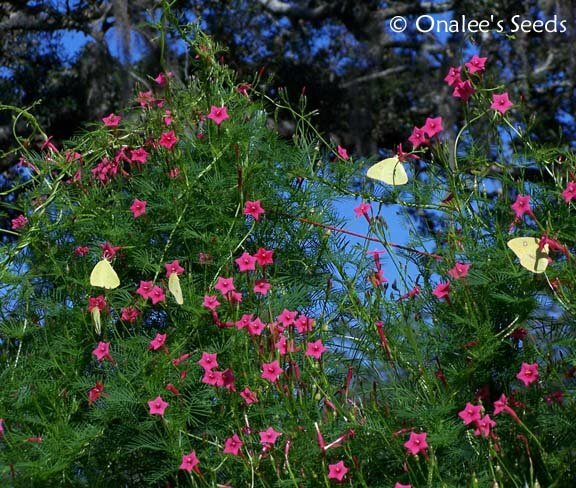 This selection of Cypress Vine has Rose Pink blooms. 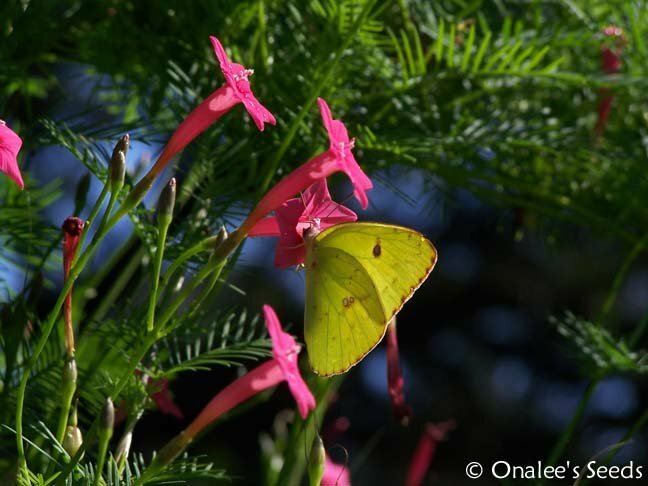 Cypress vines are attractive to hummingbirds as well as butterflies. I LOVE the fern-like foilage on these plants, so light and airy; it makes a perfect backdrop for the lovely blooms. One of the fastest blooming morning glories I've seen (about 30 days from seed!). 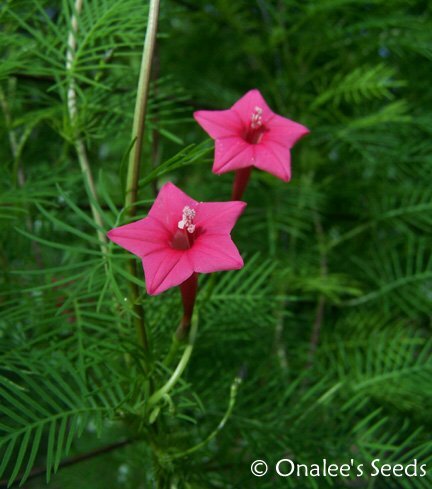 You are buying 24+ Rose-Pink CYPRESS VINE (AKA: Hummingbird vine, Star Glory) (Ipomoea quamoclit) SEEDS PLUS planting instructions, including a color photo of a seedling for easy identification. These are annuals, but readily self-sow (in zones 6 and south) for even more vines the following year! Seeds are easy to collect for re-planting the following spring in colder climates. The vines grow up to 20 feet and have dainty, feathery, fern-like leaves which form the perfect backdrop for the beautiful Pink blooms. These are perfect for covering a fence or trellis or anywhere that you?d like to screen out the rest of the world! You may also grow these in containers ? perhaps on your deck or balcony ? and let them cover the railing with their lovely foliage and blooms. Although part of the morning glory family, these blooms stay open most of the day. Once established, they need very little care and yield LOTS AND LOTS of blooms for the butterflies, bumble bees, hummingbirds and, of course, YOU, to enjoy! They grow best in sandy average soil and in full sun or partial shade and have average water needs.